Over the years, we've had many individuals and families who have participated in Team Spina Bifida who have had amazing stories to share. Here are just a few whose stories may inspire you as well. Meet the Armstrong Family. 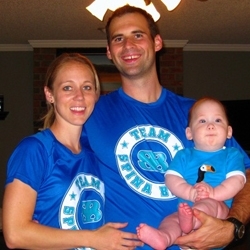 Joey and Ashley participated in the Tie-Dye Tri in Oklahoma several years ago through SBA’s Team Spina Bifida “Choose Your Own Event” program. “We needed a way to raise support for and feel connected to the Spina Bifida community since we didn’t have a Walk-N-Roll event nearby,” they said. The Armstrongs were encouraged to see many of their friends and family make contributions to their campaign after they posted information on their blog. They wound up raising more than $1,700 for SBA! Maria’s marathon was a benchmark to a new era in her taking control of her health. For years, she thought overcoming physical and medical challenges were beyond her control, but then she became aware of adaptive sports. She learned to break down the physical limits she thought she had and realized she had more control over her health than she thought. “If I can ride 26.2 miles, I can do more than I ever fathomed and more than my parents could have ever hoped for,” she said. Maria talked about her marathon to whomever she met, expressing her nervousness, excitement, and anticipation. She always made awareness her top priority. 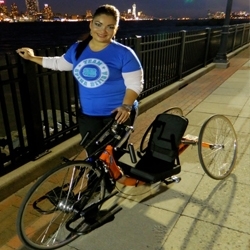 “Team Spina Bifida is about friends and family supporting you as a person,” Maria said. “Supporting the cause then comes naturally, since it has so much to do with who we are.” Maria raised more than $2,400 and now serves on SBA’s Board of Directors.